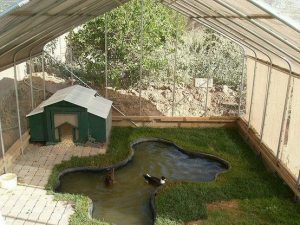 Duck coop is the main thing that you need both if you want to build duck poultry or just pet it. Basically coop should be able to cover the duck. You can put some ducks in one coop but just make sure that the size of coop is compatible with the number of the duck that you inside on it. Honestly beside the size, the materials that you used to make a coop are one of all something that you need to be attention to make a coop. Better you use the duck-friendly ingredients like bamboo. Beside it is easily to meet, the bamboo price is also cheap and moreover you can got it for free. Bamboo is a plant that usually planted by some people both in home and garden so take it one wouldn’t make them lost isn’t it? Literally there is something that you must to put your attention when you want to make a duck coop. So here are the points. The picked of location is the main factors that you need to think before start this business. Make sure that the location is far of settlement. The settlement mate would feel bother if the location of coop is near by them. The smells would disturb them and the flies when the harvest time would really annoying. Also, the flies is the main agent which has contribute to spread some disease to the settlement mate so once again you better make a coop that far from the settlement. Some settlement leader usually has rule to manage this business. Basically the rule is come from discussion and agreement by all settlement-mate. There is no goal to make this business lost but they just want to manage it as fair as they can. So usually they would looking for middle way which is how can they live well without bothering your business. That’s the point. But for people who had mass, usually they would profit it to earn money so they make a price and force you to pay something that called as retribution. Usually it is not named as that but named as ‘cleaning money’ but there is not really clean at all. But we do have to believe that not every settlement has this rule but they do have regulation to manage this thing. And about you who don’t have any ground to build coop don’t worry. You can rent a ground from people who had it. The price is surely pricey but that’s the risk that you just rent it. If you want the transparent price you can go bought it. But if your problem is budget, so you can borrow some money from bank as your venture capital. Basically poultry is profitable business which automatically and can be make sure that you will earn money. But still, as long as you do it well and know when to take a chance. Water is one of necessary thing that needed by all live creature. Human, animal, and plant does need this thing. For you who want to build duck coop, make sure that the location of coop is near by water source. So remember the keywords, ‘far from settle but near by water’. That’s it. This water will use for drink, clean the coop, clean the egg, and another thing that relatable with the coop that need water. Well this is also the main thing that you should highlight before you decided to build coop. The location of coop should safe from another predator which wants to attack the duck. Some predator that usually threat the poultry and being farmer enemy is snake. This predator usually come from a hole which usually placed on every building included the coop. They came from sanitation system which in the beginning use for water flow. Another predator that usually being enemy by the farmer is human. Well human can also being the enemy when that man tries to steal the duck. Actually you need to build security system which safe for that useable both for you and the duck. Your coop should be well access that makes you easy to reach it. Actually this point is also the highlight when the people looking for poultry partner business. The low price that you offer for them isn’t meaningful if the access is bad. The hard access makes the own lost. The size of coop should be compatible with how much the duck that you want to inside the coop. The size also should be match with the old of the duck. The older the duck so the coop is getting bigger and you can’t inside it as same as the beginning if the coop’s size isn’t added. The type of the coop should have to consider. Back to economic principal that say we must earn the biggest profit with smallest budget. Actually this principal can you use to make a coop. There are many type of coop which more modern but still usable now. Moreover the feature that offered also the latest technology which automatically gives your many profit. The types are battery coop. This coop can cover one duck only which the base is tilted so the eggs man moves straight to the shelter. This coop is has some benefit like reduce the sound that come of outside the coop. make you easier to monitoring the duck, the egg that produced it clean guaranteed, and disease control friendly. This point is similar with the first point which the profit when you choose the place that far of settlement is you can got the place which calmer. Basically duck needs calm and comfy situation. They can’t live well in noisy place. The noisy place will increase their stressed. The stressed affect directly for their productions like the produce is low both the time and the quantity. Also, stressed can stimulate some disease that threat the duck. The stressed factor can also come from you. Your voice can also make them uncomfortable, so watch your voice when you treat them like feed or take the eggs. Don’t make a loud voice. That’s all the important things that you should keep your eye when you started to building duck coop. All points above should be your main focus because one missed would be make a great problem. Let’s say it’s about location. The wrong pick of location would stimulate the angry for your neighbor who feels bothering. Besides, it would make diseases spreading if the coop is near with them. So do you want to take the responsibility if this case happen and paid their hospital bill? Well, you better take some preventive action than paid something that make you lost, right? So the conclusion that can we take about this tips are preventive act gives advantage more than cure.